Inner reef for beginner , outer reef for experts. Pickup from selected Waikiki hotels .Great deal for the whole family! The crystal-clear bay is beautiful and filled with marine life. Round Trip Transportation and snorkel gear are included. Hanauma Bay, a protected marine life conservation area located on the east side of Oahu, is managed by the State of Hawaii. There's a park entry fee of $7.50 for visitors; however, it's free for residents, military personnel, and children under 12. This is a great spot for new snorkelers, as there are tons of ocean creatures to run into without having to swim out too far. You can see the State fish -- Humu humu nuku nuku apua'a -- as well as sturgeon, wrasse, and parrot fishes, among many others. Have patience and look closely inside the crevices in the coral, as there could be an octopus or eel hiding inside. Hanauma Bay adventures are the favorites to the visitors of Hawaii. Adventures in Hanauma Bay are what bring thousands of tourists to Hawaii every year. 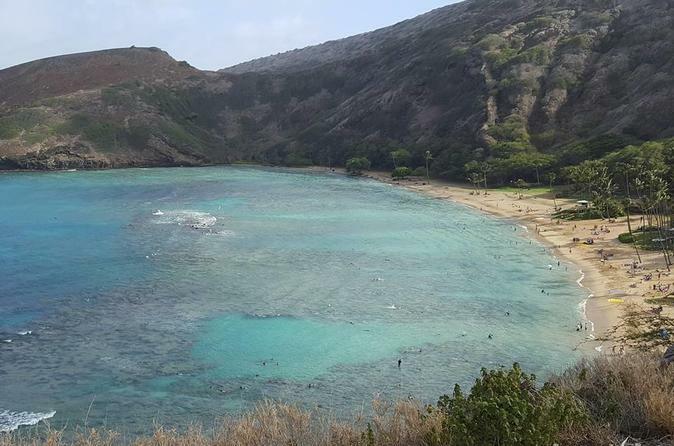 Come see what Hanauma Bay has to offer, and why thousands of tourists visit this spot at all seasons of the year.